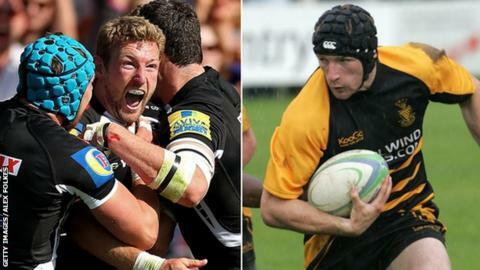 Launceston will find their level next season, says Exeter winger and former Cornish All Blacks player Matt Jess. The club will be relegated from National Two South if they lose at fellow strugglers Southend on Saturday. "If they do go down then they're going to find their level next year, I've got no doubt about that," Jess said. "They've got a good man with Jimmy Tucker at the helm, he's very passionate about the club and he knows where he can take them." Jess scored 17 tries in 30 games for Launceston in their one campaign in National One, which is now the Championship, in the 2007-08 season, before moving to Exeter that summer. Launceston have lost 21 of their 22 games this season, with their only positive result coming in a draw with Southend in November. The club have seen the playing budget cut this year while a number of their senior players from last season left the club, many joining near neighbours Plymouth Albion. But Jess, who helped out with training at Launceston earlier this month, said that the club can bounce back next season from National Three South West. "There's no point in just going down from league to league, you find your level and you crack on from there."